What would science look like if we started again? The idea of Octopus is to create a single place for all scientific research to be published… freely open to all to read and language agnostic. Instead of publishing ‘papers’, the unit of publication will be smaller: a piece in the chain from problem -> hypothesis -> method/protocol -> data -> analysis -> interpretation -> real world applicaton. Reviews will be open and treated in the same way as other original contributions. This will fundamentally change the incentive structure in science, encouraging good practice. Octopus is designed to be a community-owned platform, pulling together existing open publishing tools and encouraging others to develop additional tools and modules to make it serve the needs of science. 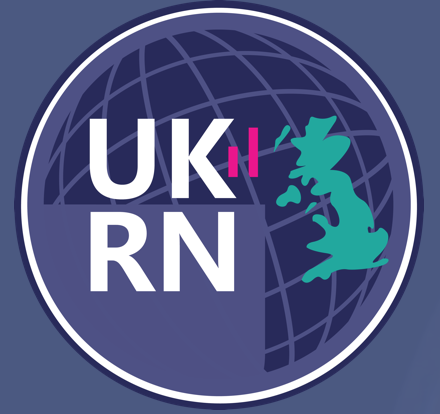 It is being developed in partnership with the UK Reproducibility Network. Break the bonds that bind science to journals and which encourage poor scientific practice. Easily find what’s being published in any scientific field, accessible to all, regardless of language and with no paywalls because it will all be in the same place and digital-first. Anyone will be able to come to Octopus and search for publications using normal keyword searching, or by browsing down the chains of linked publications. Automatic language translation will allow anyone to read the content in their native language. Clicking on an author’s name will take you to their individual page which will show you not only their academic affiliations, contact details and declared conflicts of interest, but their individual metrics. You can view everything they have written (original content and reviews of others’), along with the ratings that people have given their work (summarised in their metric graphics), and who they themselves have rated. This transparency will make it clear who is doing what kind of work and how it is judged by others. Log in and publish your own ideas, data, analysis or real-world applications. 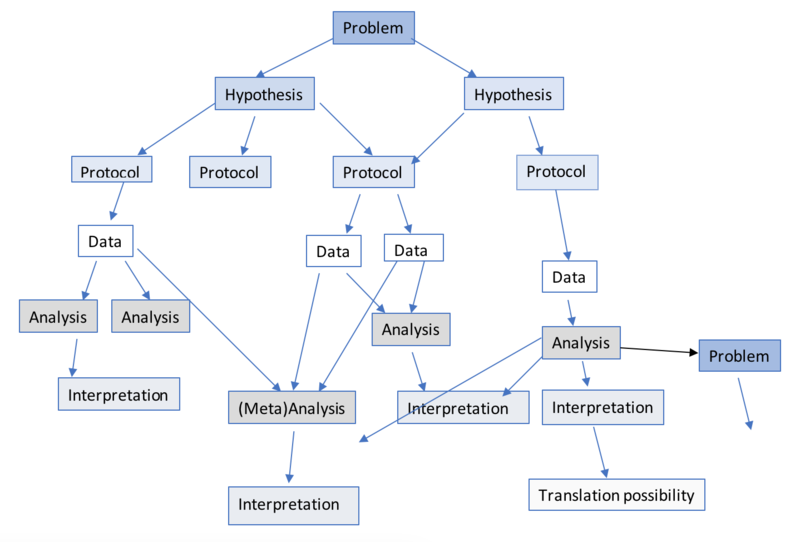 No need to create an entire ‘paper’ - new hypotheses, small data sets and ‘negative’ results all have their place in the chain of science discovery (see the ‘chain of science’ diagram below). Simply find the place for your ideas and contribute them: all your contributions are added to your personal page where peers can easily what sort of work you do and how well received it has been. With no ‘anonymous logins’ all content will be transparently linked to its author (for all to see), discouraging inappropriate use of the system. There are, however, no other barriers to immediate publication. No review boards or editorial boards or pre-publication peer-review to slow things down or create expensive layers. Instead, as soon as all authors have clicked to agree on publication, it will be immediately visible to all. Publications that have no ratings or peer reviews yet will be considered a ‘version 0’ but any registered user can add a rating and/or a written review. Well-rated publications can therefore be favoured by search algorithms. Authors can republish new versions of publications at any time (or retract them if necessary). Some may wish to respond to reviewer feedback, in which case the relevant reviewers should be acknowledged, or become co-authors. Old versions of publications are always kept in the database to be viewed, but only the most recent will be found by the search facilities, meaning that readers will not be misled by out-of-date or retracted publications. The write interface will also be language-agnostic. Write in your native language, and it will be automatically translated to the languages of your readers. No more financial or linguistic barriers to science! As a registered user, review the work of others. A replacement for traditional closed and pre-publication peer review, the Octopus system aims to value work for its scientific quality, not for its attractiveness to journal editors. All your reviews can also be ‘liked’ by other readers, and will be listed on your own author page, giving recognition for this vital collaborative work. A registered user could also leave a review. These are not just ‘comments’, they are full publications in their own right. With no anonymous log-ins, all reviews (and the number of their ‘likes’ and ‘dislikes’ by other users) will be treated the same as other original contributions and be displayed on the reviewer’s own personal page. This will reward constructive, collaborative reviewing. Algorithms could be developed to downgrade the work of authors whose work is consistently poorly rated by others (or those who consistently over-rate the work of specific other ‘friends’). Any flag will alert the author(s) of the publication being flagged, and open a page where the author can respond to the flag and comments from the reviewer. If the author does not republish a new version of the publication which satisfies the reviewer within a set period of time, the author’s institution will automatically be notified in order for them to initiate their scientific misconduct complaints procedure. After investigation, the institution will be able to rule on the retraction or not of the publication, with their decision and the history of the dispute being viewable to all. (Anonymous complaints about a publication will always still be possible through direct contact with an institution as they are currently). For more information about the Octopus system and its advantages/disadvantages, see our blog posts Octopus is Born, Fixing Science and How could Octopus break the status quo. 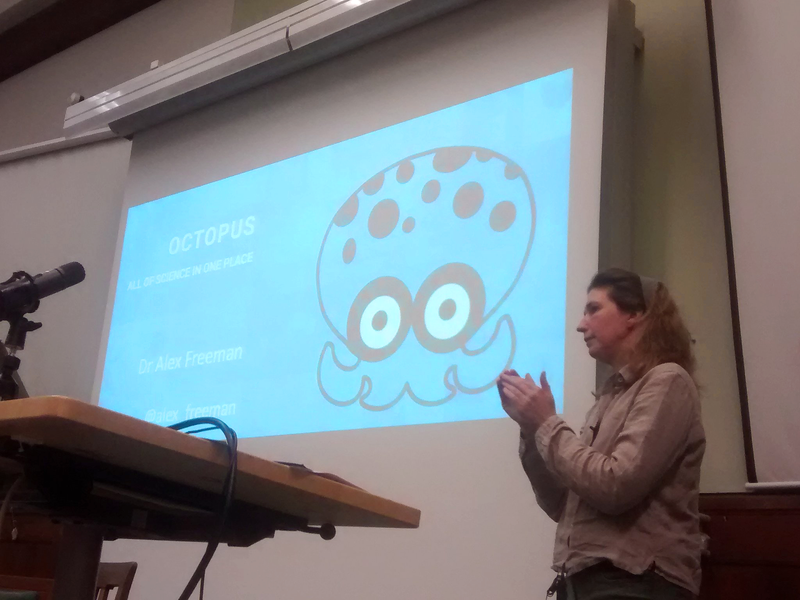 Domain and Publishing Standards - in order to allow Octopus to be a community-coded world we need to use existing standards (or create our own where they don’t exist). Are you a standards expert who could help advise? Persistent Identifiers - DOIs cost money. But every publication in Octopus will need an equivalent unique PID. Do you have thoughts on what that might be? Sustainable and Affordable - Octopus has to be a long-term solution. By automating as much as possible, using existing infrastructures and abolishing editorial roles we hope to keep running costs minimal. But do you have thoughts about what we might not have considered? Let us know!